Make sure to inspect your trees before the summer thunderstorms start appearing! Summer is just about here. It brings vacations and camp and all sorts of fun activities, hot days, and cold iced tea. But it also brings some pretty ugly thunderstorms. For some, it even brings hurricanes. When you know there’s a thunderstorm coming, you tie up your lawn furniture and trash bins, but what do you do prepare your trees? 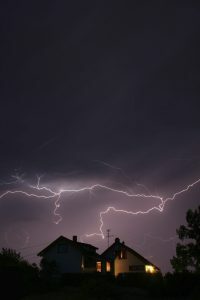 Here are some tips to help you make sure your trees are prepared for those summer thunderstorms. Is the soil heaving at the base of the trunk beneath the canopy? Is the trunk chipped, or is the bark peeling and cracking? Are there cavities in the trunk or large scaffold branches? Are there dead or hanging branches on the upper canopy of the tree? Do you see fine twigs without living buds near the ends of the branches? If you notice any of these things, you may need to stake, brace, or remove some limbs to prepare for the thunderstorms and other severe weather. Deciding to have a tree removed can be difficult. It’s not an inexpensive project. If there is a tree on your property that poses a threat to you, your family, your home, or anyone else, it’s probably time to have it removed. Tree removal can be a huge job, so it’s best left to the professionals. This entry was posted on Friday, June 9th, 2017 at 2:42 pm. Both comments and pings are currently closed.